At Glen Eden Beach Resort, located at Peregian Beach on the magnificent Sunshine Coast, you are in a great position to make your beach holiday as peaceful and relaxing or as energetic as you like. Glen Eden's beach front position is peacefully situated behind the dunes at Peregian Beach. Whether you are a family looking for great value holiday accommodation, or a couple wanting a quiet weekend away from it all, Glen Eden is the place to stay. Choose from their spacious one, two or three bedroom townhouses. Their extensive lawns and gardens are a great place to relax, as you leave your cares from the busy demanding world behind. They are just 10 minutes from Noosa, Coolum and away from the busy tourists areas. 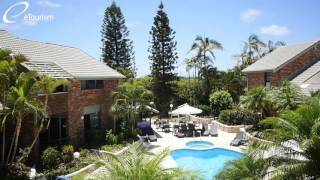 Glen Eden Beach Resort - The Great Escape! Three bedroom townhouses are perfect to accommodate the larger group or family. Thoughtfully designed, they are both spacious and comfortable. These apartments are fully self contained including a DVD player, ceiling fans, microwave, dishwasher, washing machine, dryer and free Austar. Air conditioning in the master bedroom and living area, ensuite for master bedroom shower only. Other bedrooms contain single beds, or in one case double bunk beds with single above. Two bedroom townhouses are perfect to accommodate the family. Tastefully renovated and thoughtfully designed, they are both spacious and comfortable. These apartments are fully self contained including air conditioning, DVD player, ceiling fans, microwave, dishwasher, washing machine, dryer and free Austar . Queen bed in master bedroom and two single beds in the second bedroom. Bathroom and separate shower, one toilet upstairs and one downstairs. One bedroom townhouses have all you need for a great family holiday. They are fully self contained, spacious, comfortable and well equipped. Features include a DVD player, microwave, and washing machine, dryer and free Austar. All living areas have air-conditioning.